The effortless combination of beauty and functionality present in this dresser makes it a wonderful choice for any bedroom. With a Black Cherry finish and silver-finished hardware, this piece has sleek and elegant appearance. It features six spacious drawers for clothes, jewelry, accessories, or other items. Between these drawers is a door with an adjustable shelf behind it. 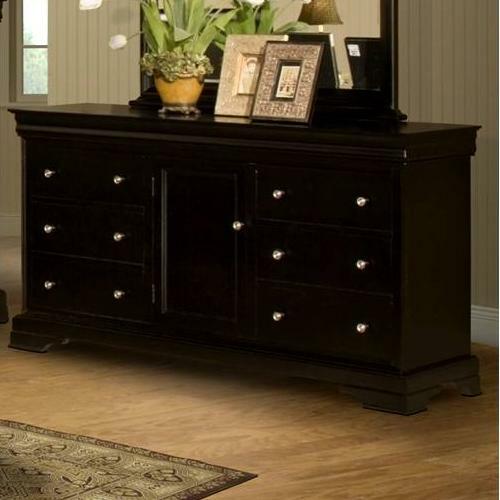 You can give your bedroom a lovely, space-saving accent piece with this charming dresser. The Belle Rose Six Drawer Dresser with Center Door and Adjustable Shelf by New Classic at Darvin Furniture in the Orland Park, Chicago, IL area. Product availability may vary. Contact us for the most current availability on this product.